In this #1 New York Times bestseller, a renowned cardiologist explains how eliminating wheat from our diets can prevent fat storage, shrink unsightly bulges, and reverse myriad health problems. Every day, over 200 million Americans consume food products made of wheat. As a result, over 100 million of them experience some form of adverse health effect, ranging from minor rashes and high blood sugar to the unattractive stomach bulges that preventive cardiologist William Davis calls "wheat bellies." According to Davis, that excess fat has nothing to do with gluttony, sloth, or too much butter: It's due to the whole grain wraps we eat for lunch. After witnessing over 2,000 patients regain their health after giving up wheat, Davis reached the disturbing conclusion that wheat is the single largest contributor to the nationwide obesity epidemic—and its elimination is key to dramatic weight loss and optimal health. 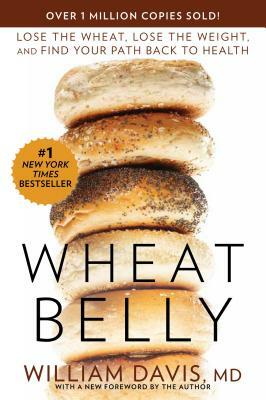 In Wheat Belly, Davis exposes the harmful effects of what is actually a product of genetic tinkering and agribusiness being sold to the American public as "wheat"—and provides readers with a user-friendly, step-by-step plan to navigate a new, wheat-free lifestyle. Informed by cutting-edge science and nutrition, along with case studies from men and women who have experienced life-changing transformations in their health after waving goodbye to wheat, Wheat Belly is an illuminating look at what is truly making Americans sick and an action plan to clear our plates of this seemingly benign ingredient. WILLIAM DAVIS, MD, is a New York Times bestselling author and a cardiologist who advocates unique, insightful, and cutting-edge strategies to help individuals discover the health hidden within them. His blog, wheatbellyblog.com, has been visited by millions of people. Dr. Davis has also shared his passion for wheat-free living on national television shows including The Dr. Oz Show and CBS This Morning. His Wheat Belly Total Health program has become a public television special, now airing nationwide. He lives in Wisconsin.